Happy Walktober! Celebrate by going for a walk outdoors. Now that cooler fall weather is finally here (at least in our area), being active outdoors is more enjoyable. October is a great time to get outdoors and go for a walk! That is the spirit of Walktober, an initiative adopted by health organizations, companies, and communities around the globe. Walking is a great way to be active to help you control your weight, increase your fitness, and improve your health. The most common form of exercise for most people is walking, and for good reason: walking doesn’t require any special equipment (beyond comfortable shoes) or skills, and you can do it almost anywhere. You can meet basic physical activity recommendations by walking briskly for 30 minutes most days of the week. Even this amount of walking can lead to a lower risk of diabetes, heart disease, and some cancers as well as improved mental health, cognitive function, and greater feelings of wellbeing. How to pass your summer vacation fitness test. If you intend to take a vacation this summer, the time to start planning is now. If your vacation will involve activities like hiking, cycling, or swimming, you also need to make sure you are ready for that level of activity. Even sightseeing and visiting theme parks can require far more activity than most people are accustomed to. Unfortunately, many people find out the hard way—sore feet and achy legs, for example—that they weren’t prepared. The good news is that regular exercise now can prepare you for your next vacation so you can focus on having fun. This is the topic of my Health & Fitness column in the Aiken Standard this week. There is good reason to choose an active vacation. Spending time outdoors can reduce stress and walking on the beach or snorkeling in the ocean seems like fun, not exercise. The end result is that being active on your vacation adds to the restorative effect of taking time away from your usual routine. In one study, people who had a physically active vacation reported that they felt mentally and physically fitter, felt more balanced and relaxed, could concentrate better during work, were in a better mood, and felt more recuperated than those who took it easy. Even if you don’t choose a vacation to participate in a specific exercise, you will likely spend time being active. At the very least, you will be on your feet a lot more than usual. It is not uncommon for visitors to Disney World to be on their feet for 12 hours and walk 10 to 15 miles in a single day. Most people don’t do that much walking in a typical week! This can lead to blisters, muscle soreness, and fatigue, limiting what you can do and, at the very least, making your time less enjoyable. If you spend much of your time sitting at work and home, you should try limit your sitting and spend more time standing and moving around. This will help you get ready for long days on your feet. If your vacation will include cycling, hiking, or other vigorous exercise, you should make an effort to build up your endurance through longer exercise sessions. And be sure to break in new hiking or walking shoes before your trip! Your travel plans may require spending time on planes and in airports. This usually means a lot of sitting, but it doesn’t have to. Airports, especially large airports, are built for walking. You can easily walk long distances while you wait for your flight. If you have enough time, you can take a walk around the entire airport, giving you an active way to pass the time. Passageways that showcase art, shopping, or other information make walking through the airport a more pleasant experience. If you are travelling with children, many airports have areas that allow kids to move and play. You can always get at least a few minutes of activity by taking a short walk rather than sitting in the gate area waiting for your flight to board. Once you are on the plane you can usually get out of your seat to stand up, stretch, and walk around a bit. Your goal should be to enjoy your vacation and the extra activity it will likely include. In addition to the numerous other health benefits, improving your fitness through regular physical activity will help you appreciate your vacation time more with less stress, meaning you can return home relaxed and ready to take on your usual routine. Time is on your side. The benefits of incidental physical activity…quickly! Regular physical activity is essential for good health and wellbeing. Despite the clear benefits of being active, only half of Americans meet even minimum recommendations for exercise and other activity. As a way to get people moving, they are encouraged to incorporate physical activity into their daily routine. This includes taking the stairs instead of the elevator or parking further away and walking to their destination. However, the perception that these “steps” take longer than the less active alternative may serve as a disincentive for many people. Studies conducted by my students at USC Aiken show that these forms of what I call incidental physical activity do not necessarily take longer than the less active alternatives. In fact, in most cases the active way is quicker! This is the topic of my Health & Fitness column in the Aiken Standard this week. In one study, we examined the time required to ascend and descend one floor using either the stairs or elevator in a building on the USC Aiken campus. The results showed that the time required to take the elevator was about twice that to use the stairs (36 vs. 16 seconds). The increased time on the elevator was due to waiting, in some cases almost one minute, for it to arrive. It is worth mentioning that this study was conducted in a building with two floors. To be sure, the elevator would be quicker if you were going up or down several floors. But let’s be honest, not many buildings in our area have enough floors for this to be relevant. For most of us, the stairs will be quicker most places we go. In another study we compared the time required to park in the first convenient parking space in the parking lot as opposed to driving around searching for a space closer to the destination. We asked several people to record the time required to enter their destination after either parking in the first convenient space compared to searching for a parking space closer to the destination on campus and at businesses in the community. The time required to search for a parking space closer to the destination was significantly greater than the time required to park in the first convenient parking space on campus and at stores. Driving around looking for a closer spot meant that it took an average of three minutes to enter the destination building. It took people about half that long if they parked further away and walked. These studies show that taking a few extra steps in the parking lot or on the stairs is actually quicker than driving around and parking closer or using the elevator. This information might help people decide to be more active. And these small changes may lead to further healthy choices. Of course, simply using the stairs instead of the elevator or talking the first available parking spot isn’t going to replace regular exercise. But making activity a part of your everyday routine is an important part of developing a healthy lifestyle. In fact, a recent study suggests that multiple bouts of activity as short as a few minutes can add up to equal the health effects of a single prolonged exercise session each day. Now that you know that active choices won’t necessarily slow you down, what ways will you save time by being active? It’s not too late to celebrate Walktober! Walking is a great way to be active to help you lose weight, increase your fitness, and improve your health. The most common form of exercise is walking, and for good reason: it doesn’t require any special equipment (beyond comfortable shoes) or skills, and you can do it almost anywhere. Now that cooler fall weather is finally here, spending time being active outdoors is more enjoyable. That is the spirit of Walktober, an initiative adopted by health organizations, companies, and communities around the globe. October is a great time to take advantage of opportunities to go for a walk! Walking, like any exercise, has substantial health benefits. These benefits are even greater if you are active outdoors. Being active in a natural environment has been shown to have an impact on mental health including enhanced feelings of energy and diminished fatigue, anxiety, anger, and sadness compared to similar activity conducted indoors. Research shows that exercise outdoors leads to physiological changes in brain blood flow that are associated with psychological benefits. When you go for a walk outdoors you may get a better workout. This is mostly due to the fact that you will likely walk faster outdoors, but other factors like uneven ground and hills add to your effort. The good news is that even though you may exercise at a higher intensity outside, you may feel that your effort is lower than for the same exercise indoors. This is partly because the pleasant visual stimuli outdoors distracts you from sensations of effort during exercise. And much of the psychological benefit of outdoor exercise occurs in the first five minutes, so even short bouts of activity are meaningful. If you are new to walking for exercise, you can start with 10–15 minute sessions and work up to 30 (or more!) minutes at a time. This can be as simple as going for a short walk outside when you have a break at work or taking your dog for a walk around the neighborhood. It’s also a good idea to walk with a friend or in a group, which can provide motivation and accountability. And, of course, it is a great way to spend time together. If you have been exercising indoors, this is a perfect time to take your activity outdoors. Going for a hike in the woods or a long walk around town can build your endurance, especially if you encounter hills along the way. Running outdoors can break the monotony of the treadmill or other indoor exercise equipment. This might not replace your workouts at the gym, but it can certainly add to your activity. 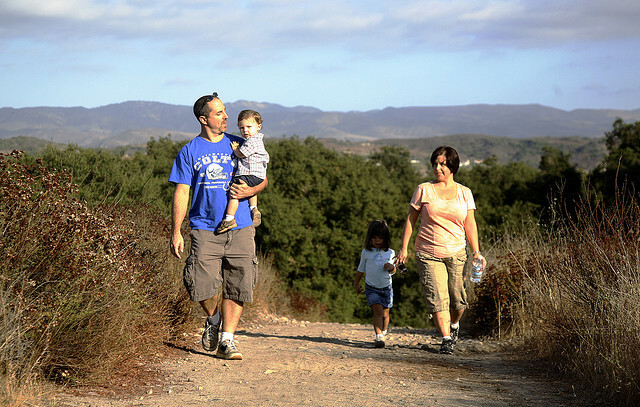 The best part is that walking outdoors is something the whole family can do. Beyond the health benefits for everyone in your family, it sets an excellent example for your kids (and grandkids). Many experts agree that increasing opportunities for outdoor play and exercise is important for helping children grow up healthy and happy. Every little bit of activity you do outdoors will have both physical and psychological benefits to help you become and feel healthier. So, get outside and get active this Walktober! Start planning for your summer vacation now. If you intend to take a vacation this summer, the time to start planning is now. Of course, you need to make figure out where and when you want to go, make travel arrangements, and plan activities. If your vacation will involve activities like hiking, cycling, or swimming, you also need to make sure you are ready for that level of activity. Even sightseeing and visiting theme parks can require far more activity than many people are accustomed to. Unfortunately, many people find out the hard way—sore feet and achy legs, for example—that they weren’t prepared for this level of activity. The good news is that regular exercise can prepare you for your summer vacation so you can focus on having fun, not your tired body. This is the topic of my Health & Fitness column in the Aiken Standard this week. There is good reason to choose an active vacation. Simply spending time outdoors can reduce stress and make you feel better and walking on the beach or snorkeling in the ocean seems like fun, not exercise. The end result is that being active on your vacation adds to the restorative effect of taking time away from your usual routine. In one study people who had a physically active vacation reported that they felt mentally and physically fitter, felt more balanced and relaxed, could concentrate better during work, were in a better mood, and felt more recuperated than those who took it easy. Even if you don’t choose a vacation to participate in a specific exercise you will likely spend time being active. Most vacation destinations are selected in part because there are interesting sights to see or are easy to get around without a car. This means you will be on your feet a lot more than usual. Think about a family trip to Disney World. It is not uncommon for people to be on their feet for 12 hours and walk 10–15 miles in a single day. Most people don’t do that much walking in a typical week! This can lead to blisters, muscle soreness, and fatigue, limiting what you can do and, at the very least, making your time less enjoyable. Since regular exercise promotes endurance and strength, being fit can make it easier to get through long days on vacation. If you spend much of your time sitting at work and home, visiting a museum or standing in long lines at a theme park can be daunting. But if you spend more of your day up and moving you will have an easier time in these situations. A whole day walking around sightseeing can be exhausting, but less so if you are accustomed to taking long walks. That isn’t to say that you should start walking for 10 hours each day, but doing activities that last for at least an hour will help. Here are some tips to help you prepare for your next active vacation. You should limit your sitting time and spend more time standing and moving around at work and at home. This will help you get ready for long days on your feet. Dedicating 30 minutes each day to being active will build endurance, and you can get bigger benefits from doing more. If your vacation will include vigorous exercise, building strength through resistance training and flexibility through stretching or yoga can help you avoid injury. Your goal should be enjoy your vacation and the extra activity it will likely include. In addition to the numerous other health benefits, improving your fitness through regular physical activity will help you appreciate your vacation time more with less stress, meaning you can return home relaxed and ready to take on your usual routine.